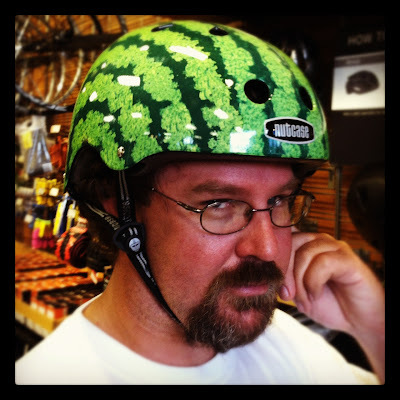 We went bicycle shopping again today - this time we hit an REI in North Carolina. We found a great rack that we could use on the truck, something Ed's been trying to find for a while. We may be very close to getting the actual bike now. While shopping, we tried on some helmets. I picked out the one above for Ed to try on. I LOVE it. Especially since I've been on a mad watermelon kick all summer. I took a picture of him in it and texted it to my best friend saying, "A bicycle helmet in watermelon motif to protect Ed's melon." She replied, "OMG! And all that hair underneath...he'd have to be dropped out of a plane to split that Honey Dew! LOL"
She's right, he does have a lot of fluffy, shock-absorbing curls. When I tried on a flowered version, Ed noted that the label on the front said, "Nutcase". I think he found that more amusing than the Honey Dew crack.